Archaeological heritage spaces attract the interest and involvement of a wide range of individuals and social groups, such as archaeologists and other heritage profession­als, tourism entrepreneurs, international and national tourists, politicians, members of local communities etc. Their interplay sets off multiple processes of voicing, negotiating, mixing and interlinking cultural concepts and pract­ices, which in turn shape the trajectory of the archaeol­ogical spaces. While recent research has developed and adopted concepts like “heritag­isation’ and “transculturality’ to grasp these phenomena, little work has been done to systematically describe and analyse such processes in relation to archaeo­logical heritage sites in non-western contexts. Barbara Kirshenblatt-Gimblett defines heritage as a mode of cultural production that has recourse to the past and produces something new. But heritagisation can also be seen as a process of turning lived practices and lived-in materialities into “heritage’, transposing them into an alienated heritage sphere with its own standards and operations. Recent work on the global spread of museums and their hybridisation, i.e. transformation which their concept experiences in non-western spheres, may serve as a parallel to assess these processes. Likewise, Byung-Chul Han’s concept of “hyper­culturality’, denoting an expo­nent­ial diffusion of cultural practices and forms of expression and the dis­solution of cultural boundaries, seems particularly suited to the analysis of phenomena witnessed in these contexts. While the proclamation of “heritage status’ alone can turn archaeological places into an arena of manifold political and cultural expressions, these same places are often additionally subjected to severe physical trans­format­ions. Usually, archaeologists and other heritage professionals claim and enjoy privileged access to archaeological sites for the sake of research and preser­vation. Based on the logics of their expert cultures, they introduce operations and regulations, which aim at a “correct’ handling of archaeolog­ical sites as spaces sui generis worldwide and thus exert strongly homogeniz­ing tendencies. One major instrument in the dissemination of the heritage concept is the UNESCO world heritage scheme. As it adds to the universal claims of much heritage practice, it is worth investigating its dynamics on various national and local levels. 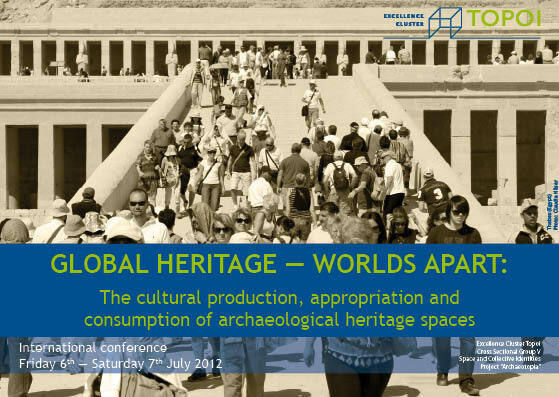 In adopting the notion of “cultural heritage’, archaeological spaces are perceived as crucial localities for the (re)production of knowledge and the construction, presentation and negotiation of collective identities also by other stakeholders. Accordingly they can be impregnated with very divergent messages or adapted for intensive ideological or commercial exploitation. Much heritage research underlines the importance of heritage places as an economic factor in the context of international and national tourism and sustainable development. However, interventions into archaeological places necessarily under­mine their complex processual character in favor of creating static “Lebens­welt’ tableaux, which abridge the complexity of the archaeological record and result in homogenizing presentations of the past. Thus, extremely heterogeneous archaeological sites are adjusted to converging procedures of appropriation, which facilitate the contact of versed visitors with a temp­oral­ly as well as culturally distant material world, but seriously deny the allegedly “authentic’ nature of processed material relics of the past. Exploring an archaeological site on a foreign continent can become easier than plunging into a socially unfamiliar lived environment next door. These distinct routines make tourist visits a social practice sui generis, detaching the visited space from any social practices to which it may have been previously connected. Within these outlines, the conference aims to discuss methodological approaches and select case studies addressing the complex processes which arise from the production, appropriation and consumption of archaeological heritage spaces. Its regional focus is on northern Africa and the Near East, i.e. settings where the concepts of “global heritage’ and “archae­o­logical place’ and the ensuing practices are ideational imports whose adoption and transfor­mation result in particularly vibrant analytical constellations – as many recent examples show. Palestinian/Israeli heritage in conflict: From "kitchen conversations’ to "coalitional politics"